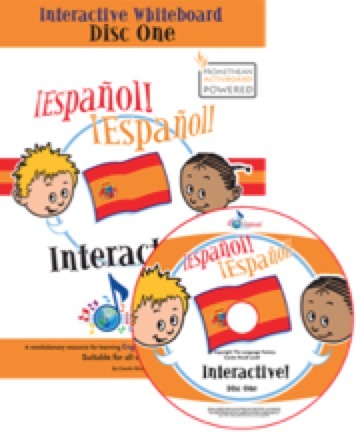 We provide the finest resources for teaching language with music. We produce PDF, MP3 as well as printed books with CD. Learning languages through song, rap & rhyme. Using the power of music and rhythm to subconsciously learn languages. For use by teachers & parents. Suitable for all children (0 - 10 years old) — and fun-loving adults. 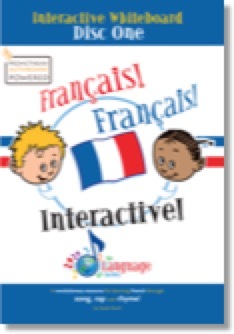 Scroll down the page to see all the language products available - English, French, Spanish, Italian & German. The English! English! 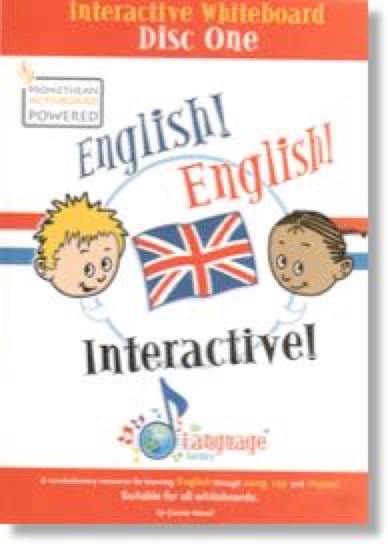 book comes in full colour and features a vocabulary page, where each vocabulary item in English has a picture. Opposite this is a page where this vocabulary is used in short simple conversations, poems, popular songs, traditional folksongs, raps and jokes. There is a CD reference for each one so that the tracks can be easily located. A basic but comprehensive grammar section is featured at the back of the book. It could not be more user friendly! Perfect for the pupil, teacher and the primary or non specialist teacher, or teacher of special needs. The English! English! full colour book with 4 audio CDs featuring many tracks of songs, conversations, raps, rhymes and jokes all recorded by native speaking children. 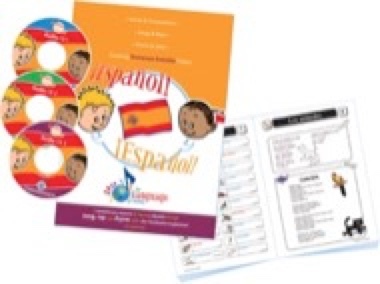 The full pack, book, audio CDs and the Teacher’s Resource Rom. 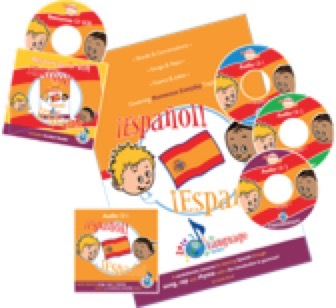 The Teacher's Resource CD-ROM has been designed to enable teachers to gain the maximum from the book & audio CDs and is full of ideas for photocopiable games and worksheets. Interactive Whiteboard Disc can be used on any whiteboard. Video of action songs is included. Exciting, energetic and colourful, the flipcharts have been written specifically for use on the interactive whiteboard. 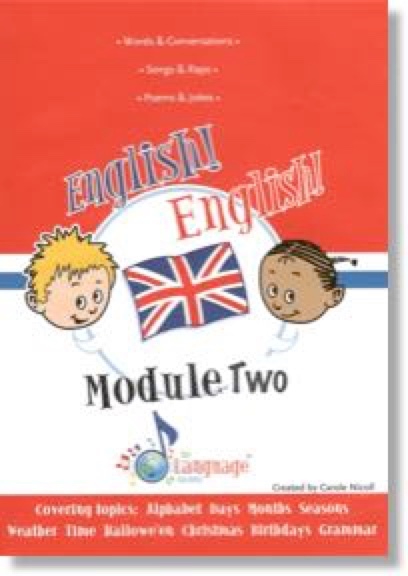 They offer a new dimension to this teacher-led course which will stimulate and engage children as they acquire English language skills at the same time as having fun in the classroom. There are 18 flipcharts, each with up to 32 pages, covering the topics: Greetings • Colours • Days • Months • Classroom Numbers and Weather. The Français! Français! book comes in full colour and features a vocabulary page, where each vocabulary item in English has a picture. Opposite this is a page where this vocabulary is used in short simple conversations, poems, popular songs, traditional folksongs, raps and jokes. There is a CD reference for each one so that the tracks can be easily located. 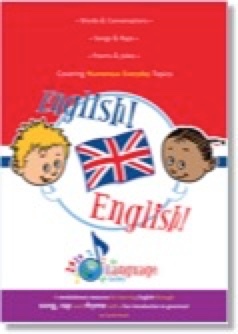 A basic but comprehensive grammar section is featured at the back of the book. It could not be more user friendly! Perfect for the pupil, teacher and the primary or non specialist teacher, or teacher of special needs. The Français! Français! 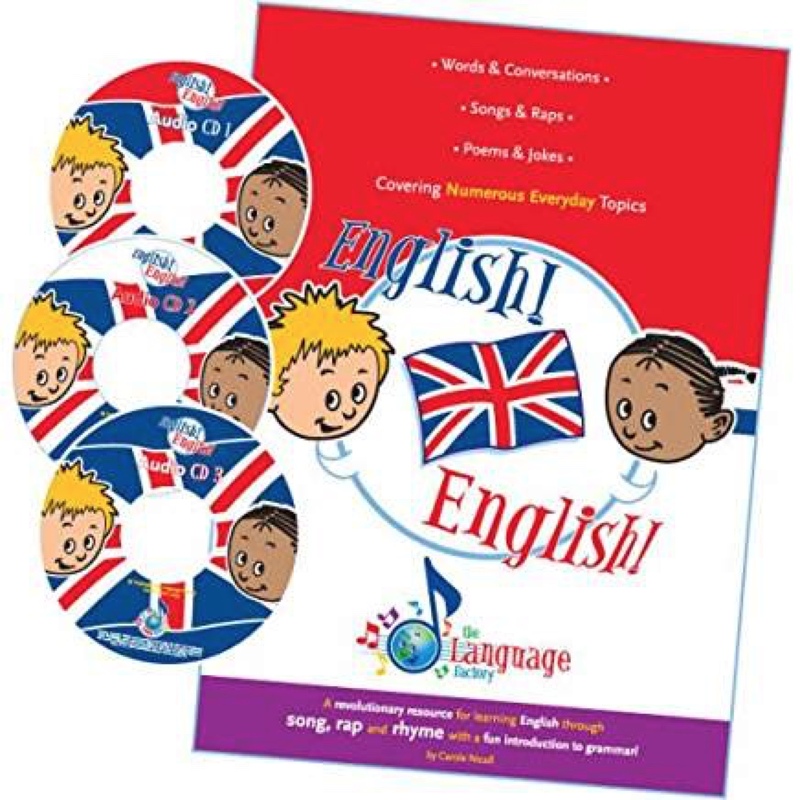 full colour book with 3 audio CDs featuring many tracks of songs, conversations, raps, rhymes and jokes all recorded by native speaking children. The full pack, Francais! Francais! 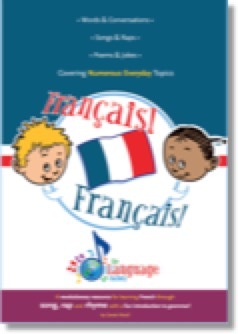 book, audio CDs and the Teacher’s Resource Rom. 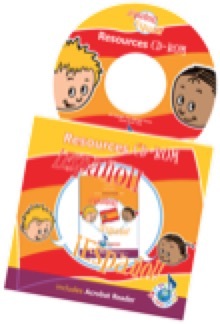 The Teacher's Resource CD-ROM has been designed to enable teachers to gain the maximum from the book & audio CDs and is full of ideas for photocopiable games and worksheets. 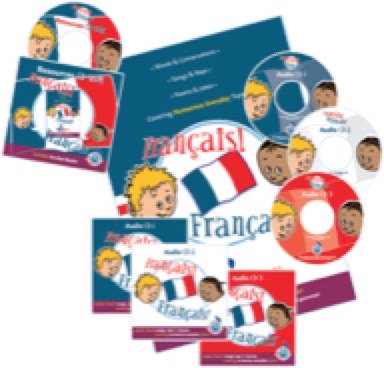 Three audio CDs to accompany the Français! Français! book and teaching materials. The Espanol! 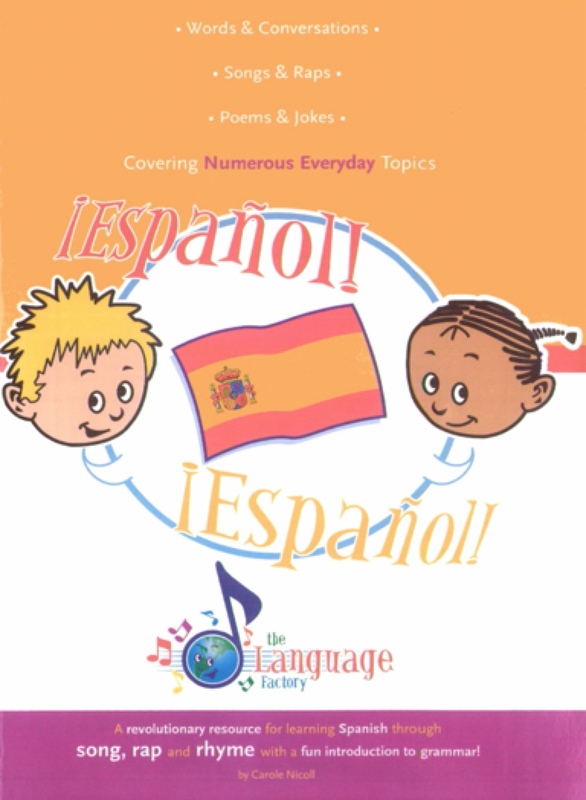 Espanol! full colour downloadable book with 3 audio CDs featuring many tracks of songs, conversations, raps, rhymes and jokes all recorded by native speaking children. 14. Conversación ‘Qué es esto? 22. Canción ‘¿Dónde está ?'K1.44. 23. Conversación ¿Qué día es hoy? The Deutsch! Deutsch! full colour book (downloadable) with 3 audio CDs featuring many tracks of songs, conversations, raps, rhymes and jokes all recorded by native speaking children. The Italiano! Italiano! full pack, downloadable book, 3 audio CDs & resource Rom featuring many tracks of songs, conversations, raps, rhymes and jokes all recorded by native speaking children.